The serial and model numbers on a genuine Rolex are deep and marked in very fine, solid lines. Rolex engravings are so fine that they will actually give off a powerful, diamond-like shine when held at an angle to a light source. Lower-quality counterfeit engravings may also have a “sandy” appearance due to acid used in the engraving process. Rolex is famous for its five-pointed “crown” logo. That said, if you ever find a watch that lacks the “Rolex” name or crown insignia, it’s most likely not a Rolex. If a “Rolex” crown ever has more/less than five points, if the ends of its points are not nicely shaped circles, or if the design looks generally sloppy, it’s most likely fake. If you can look into the back of the case and see the movement, a Rolex watch will always have the company’s name engraved onto one of the plates of the movement, potentially along with “Geneva, Switzerland,” the type of metal used, and model number of the movement. While Rolex did produce a line of quartz watches (electronic, battery-powered) until around fifteen years ago, these watches are very rare. If an opened Rolex case reveals a battery-powered movement, it is most likely not a genuine Rolex. While genuine Rolex movements are generally mechanical and do “tick” like most other watches, they do so much more quietly. In a quiet room most watches can be clearly heard ticking away, whereas Rolex watches are much more difficult to hear due to how finely they are built. An original Rolex dial should be virtually perfect. If you find any unevenness in the lettering or font used, weirdness in spacing between letters/words, or spelling mistakes, then it’s definitely not a real Rolex. A real datejust Rolex has a magnifying lens above the date window on the dial. This small part on the crystal should curve upwards (out and away from the flat crystal) and magnify the numbers in the date window directly below it. 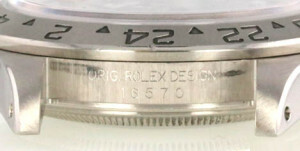 The lens on an original Rolex crystal should magnify the date numbers by 2.5 times. If the magnifying lens is flat or doesn’t magnify the date that much, then the watch may be a fake. Rolex watches are built to be sturdy and waterproof, whereas cheaper counterfeit versions will not pass a proper pressure test. When submerged in water in a pressure chamber, the air in a Rolex should not “bubble out” when the pressure in the chamber is reduced. If it does, it may not be a genuine Rolex. Mark, excellent article! Wondering about the pieces from yukiwatch, I saw a 1665 double red with original movement and parts, yukiwatch case and bracelet and their case stamped. I hope my Sub is real ! a Very informative post, thanks so much Mark ! I bought used Rolex watches for my wife and myself from reputable sellers. But even though they were reputable, I took both watches to our local jewelry store which sells Rolex watches. I had them open them up and inspect each one to be sure they were real. In addition, they wrote the reference and serial numbers down for me which I compared to the ones supplied to me when I bought them and they were the same. The jeweler said to me, “I have good news for you. You bought genuine Rolex!”. Good info for when I do buy a Sub. Love the last picture! Thank you! this is another great tutorial. Great post! Some things you left off the list include small cases, undersized movements (this is shown in your “quartz” item but not discussed), display backs, misspellings of engravings, and -T- markings on modern watch dials that have Super Luminova luminous material. All of that said, many of these rules don’t apply to vintage Rolexes unless you want to pay absolute top dollar for one restored by the mother ship. Rolex made a lot of really flimsy bracelets that you might mistake for fakes based on what bracelets are like today. Older Rolexes like Oyster Precisions will have had many services, may not have original crystals and crowns, may have some generic internal parts, and may have had dial restoration done (that restoration, btw, was pretty routine in the olden days, particularly since watches weren’t really waterproof). That frequently leads to dials that don’t pass the microscopic examination for crispness, and even the original dial finishing may not, depending on the era (and this is true of a lot of brands – dial printing changed for the better over time). 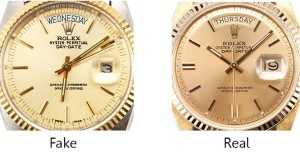 Rolex makes a mint “correcting” these problems when watches get sent in to them. And they certainly make a mint scaring people into thinking everything not sold new through an AD is counterfeit. But for older watches, you will also see on comparing a real one to a fake that older fakes just weren’t that good – and in many cases very obviously not the right watch. Thanks, Mark. We appreciate the educational materials. Excellent. You might add the almost invisible crown logo on the crystal. That crown logo etched into the crystal has only been on relatively recent models, therefore many genuine older Rolex models will not have that on their crystal. 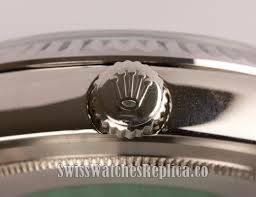 Mark – as a point of curiosity do you authenticate Rolex’s when they are sent to you for service. If you think one is a fake do you let us know? I believe I know the answer is YES because you are an honest guy I have trusted for years with my TAG and my Rolex and I am 100% a repeat customer. None the less I’m curious to see your answer. All the best for a wonderful holiday.